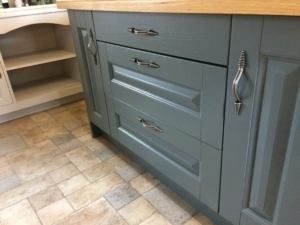 Kitchen painting and spraying has always been around, with new kitchen companies factory-finishing their products and bespoke high end kitchen companies having hand painted finishes on their new installs. What has not been so obvious to residential customers is that they can have their existing kitchen sprayed to a factory finish. 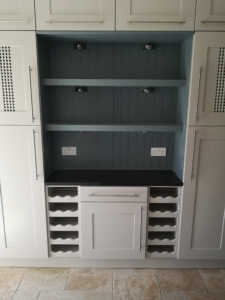 Whether your kitchen is laminate, wrapped, stained or painted wood we have the skills and expertise to spray a long lasting durable finish in any colour you like. We are aware of several companies offering kitchen painting and spraying services who do not follow these preparation principles, so please be cautious and always see samples of work before proceeding. We have clients all over the South West who would be happy for you to come and take a look at their kitchen spray-job or chat on the phone. We have over 70 feedbacks on Checkatrade, all with the project pictures attached so you can see what they had and how they felt about it. We believe we are only as good as our last kitchen spraying job and will ensure you are satisfied before leaving. 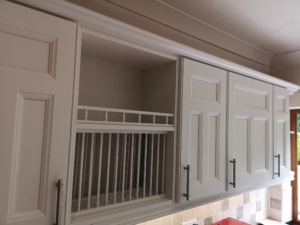 You will find your kitchen fitted better than when we first arrived as we sort hinges, alignment and other adjustments as we put on the newly sprayed doors. In the unlikely event of any finishing or fitting issues we will come and rectify as a priority. If you would like to find out about respraying your kitchen please use the contact form and upload some pictures. We will get back to you within 24 hours.